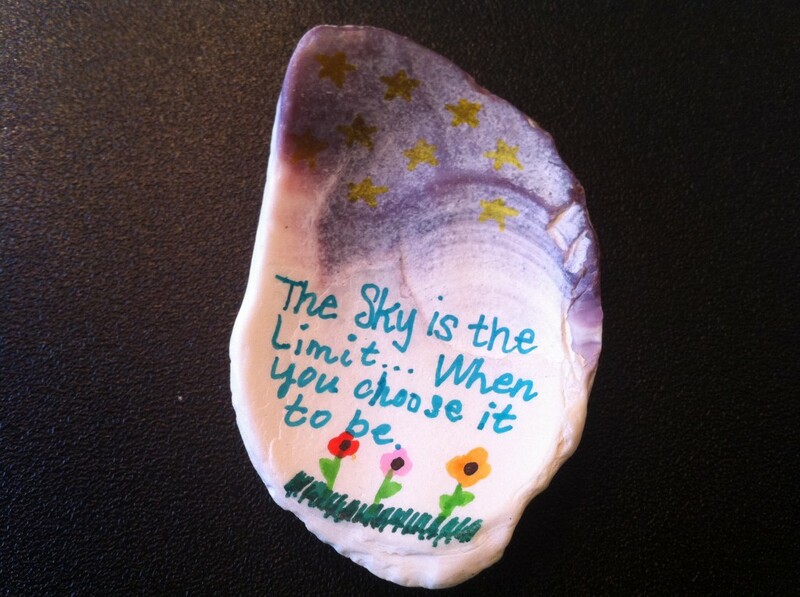 The Sky is the limit…When you chose it to be. Home / Adviart Blog / The Sky is the limit…When you chose it to be. The Sky is the limit…When you chose it to be. This adviarter picked a shell because of the natural backdrop that it has. The adviarter saw the purple as a night sky and drew in yellow stars. She utilized the nature of the shell as she mixed words and drawings to share her advice. The adviarter had two pieces of advice but went with her second one–dealing with the ability to set limits for ourselves when we have no constraints. The adviarter’s first piece of advice had to deal with angels and not going faster than they can watch over us. The original reference to the first advice was to the speed at which one drives a car. The colors purple and teal were used–the adviarter’s favorite color. One side was decorated to the fullest extent with pretty, colorful flowers on the bottom or our shell. This adviart aligns with a lot of my interest in learning about perspective. The Sky is the limit–as we see it. Seeing the limit is a choice. Pushing the limit is a choice. Constraints are always present but it depends on how we look at them as to how we let them affect us. How will you go about setting your limit–or better yet, will you choose to set a limit?